King Bard the Bowman The valley of Dale lies directly south of the Lonely Mountain and overlooks the Long Lake. It was populated in the Third Age, and perhaps earlier, by tribes of Northmen who originally inhabited the entire region between the rivers Celdiun and Carnen. The city itself was founded in 2590 and flourished through trade with the wealthy Dwarves of Erebor.But the dragon Smaug, attracted by the treasures of Erebor, attacked the Dwarven kingdom in 2770, destroying it and leaving Dale parched and ruined. 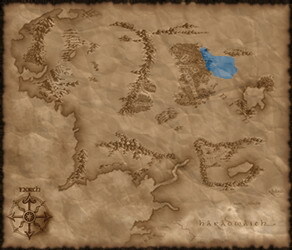 The survivors fled south and lived amongst the Lake-men of Esgaroth, also known as “Lake-town”. In 2941 the men of Dale, allied with the Dwarves and Elves, successfully drove back an army of orcs and wolves at the Battle of Five Armies. In the same year, Bard the Bowman, exiled heir to the throne of Dale, shot Smaug with a single arrow as it attacked Lake-town, defeating the dragon at last. The people of Dale returned home and begun rebuilding their once prosperous city, with Bard – the Dragonslayer – chosen as their new leader and King.Finally free from the threat of Smaug, Dale and Lake-town, united under Bard, are steadily regaining their former strength. Perhaps it would be wise to pursue the orcs, attacking their strongholds in the Misty Mountains. The Dwarves of Erebor, our steadfast allies, also harbour a great dislike for them; they will surely join our cause. Another course of action would be to turn to the East and reclaim the lands of our ancestors from the wild and barbaric Easterlings.Dale’s armies consist of militia and knights from the city as well as Northmen mercenaries from surrounding lands. Weapons and armour bought from Erebor ensure only the best quality, and the bowmen of Dale are known for their skill, discipline and courage. Very well trained archers, armed with longbows and short swords, protected with heavy lamellar armor. Heavily armoured infantry, equipped with heavy iron shields and long swords. Made up from the cream of Dale's nobility, these heavily armoured earls are deadly in melee and hard to kill. Light infantry, best used to guard settlements or in a supporting role. Tough farmers and settlers of Dale, armed with big two-handed axes. Clad in padded armor and armed with longswords and shields, these swordsmen are the backbone of Dale's army. Heavily armoured guards of Dale's nobility, equipped with halbers and partial plate armor. Highly skilled veterans, armed with massive two-handed swords. Trained and deadly longbowmen, being totally unarmoured means they need to stay out of melee. Cheap to recruit and equip, yeomen are useful for running down fleeing troops and scattering archers. Good all-around mix and various troop types. Lacks early heavy infantry units, rare cavalry.